Look up! It's soon time to be dazzled by one of the year's best meteor showers, the Geminids. As meteor showers go, this is a good one. At peak activity, if you are enjoying clear, dark skies, you may see up to 120 meteors per hour (two per minute!). At 2:00 a.m., when this shower is ripe for best viewing, fix your eyes on the twin stars of the constellation Gemini: Castor and Pollux. From our Bay Area latitude, Gemini will be located almost directly overhead. This meteor shower's "radiant" — the point where the meteors appear to be radiating outward from — is in Gemini. The meteors can appear almost anywhere in the sky, but most activity will be seen around the radiant. If you live in or near a big city, try to get yourself to a spot with darker skies. The same urban night-glow that lets you see only a dozen or so of the brightest stars will also limit the number of meteors you can see. 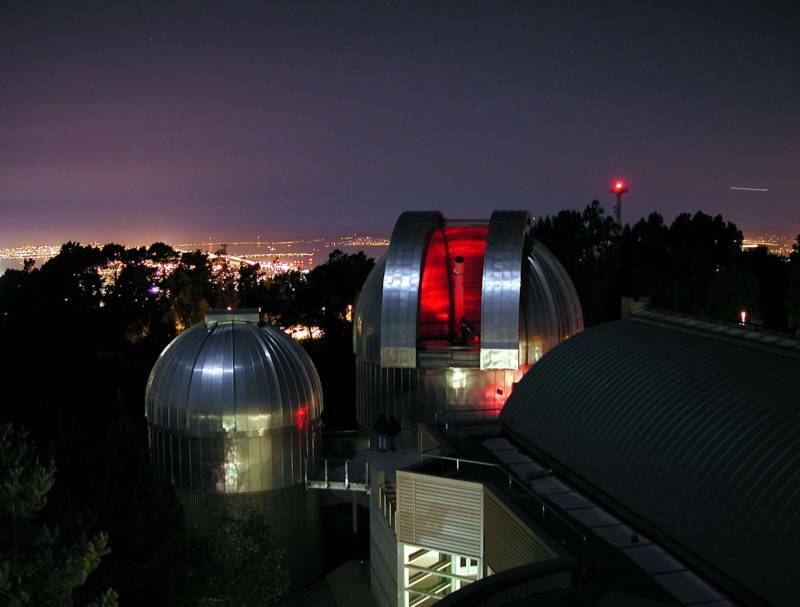 Even in the San Francisco Bay Area, with its ample sprawl and light pollution, there are many relatively accessible good viewing spots at least partially protected from urban light's full blast. Just remember, the farther away from cities, the better, and natural barriers (such as forests or hills) can serve as shields to light pollution. Click here for some ideas about possible dark places near you. 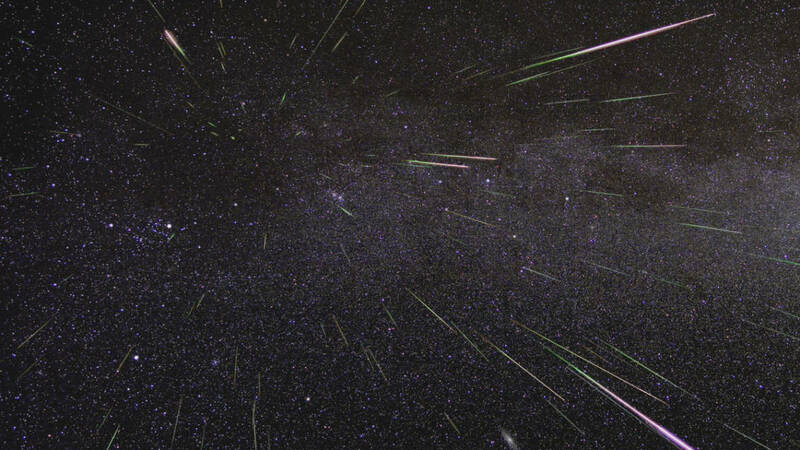 A meteor shower occurs when Earth passes through a stream of dust particles. Earth travels around the sun at 18 miles per second. Dust particles also zip along at extreme speeds. So, when the dust grains hit Earth's atmosphere, intense frictional heat incinerate the particles in a flash. From the ground we see fast, brilliant streaks of light. The burn-up happens at an altitude of about 60 miles — so you can imagine how hot and bright those tiny pebbles of rock or metal are if you can see them from such a distance! If you were wondering why you have to get up after midnight to enjoy a meteor shower, it's because of which side of the Earth faces into the dust stream as it plows through. It is under morning skies when we are on that leading side of the Earth, making all meteor showers of the year early morning events. In a similar way, it is only on the windshield of a car that you see the streaks of insects that the car has plowed into, while the rear window remains relatively streak free. 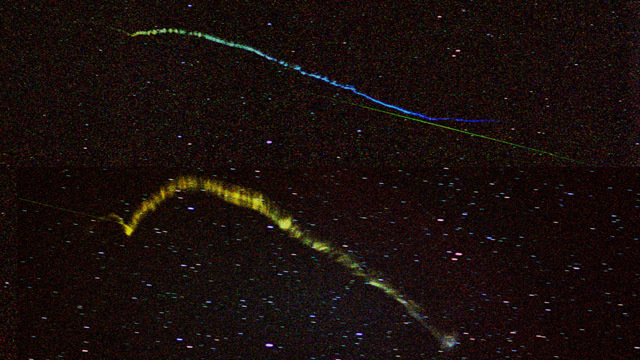 The dust streams that produce meteor showers are generally created by a comet leaving a trail of debris as it swings close to the sun. There are exceptions though. The Geminids shower's dust-supplying parent is not a comet, but a special type of asteroid sometimes called a "rock comet." Typical comets are largely made of frozen volatile materials, like water ice, with a lot of dust mixed in. When they heat up in sunlight while passing through the warmer reaches of the inner solar system, some of the frozen materials turn to gas and blow outward into space. The embedded dust is carried along for the ride. In contrast, a rock comet is thought to be mostly made of rock or metals (like an asteroid) but with a good supply of frozen volatiles as well. 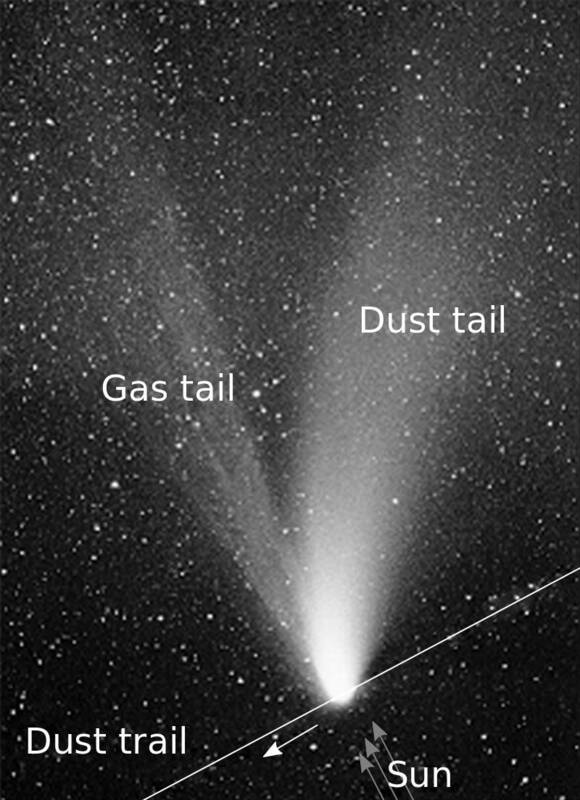 So, when it passes close to the sun, the rock comet also blows off gas and dust. The Geminids' parent object is called 3200 Phaethon, an asteroid that orbits the sun once every 1.4 years on an elongated ellipse. At the farthest point of its orbit 3200 Phaethon dwells beyond the orbit of Mars, but at its closest point (perihelion) it comes as close as 13 million miles from the sun — about three times closer than Mercury! Winter skies are often darker and clearer than those at other times of the year, cloudy or stormy weather excepted. As you lay under those glittering, meteor-punctuated skies, keep in mind that each brief flash you see is the end point of the millions- or billions-year journey of a single piece of space rock.